If you are looking for a peaceful single-family home located in Keystone Ranch then look no further! 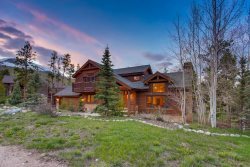 Forget Me Not boasts 5 bedrooms and 6 bathrooms and is approximately 4,000 square feet of pure Rocky Mountain joy. Nestled in the trees is your next home away from home that will fit your entire group’s needs. The large amount of patio space looks out upon the mature forrest and beautiful Colorado views. You can either take advantage of the downstairs patio with a private hot tub and gas grill, or the upstairs deck for more expansive views; the choice is yours. The Keystone Ranch area of Colorado is located further into the Keystone Valley and is home to two world class golf courses, perfect to utilize in the summer months! The Ranch is mostly full of private, high-end homes that are perfect for a family reunion or simply to get the gang back together. If you’re looking for a little privacy, more space and a well designed floor plan, this property will make you feel right at home. Surrounded by bike trails and National Forest, Forget Me Not will help you get in touch with nature and allow you to appreciate mother nature and all her beauty. Luckily, this home is not too far from dining and shopping that you won’t feel too cut off from the rest of the world. Here you will find hiking and biking trails for the summer and cross country ski trails and sledding hills during the winter. Near the property is the Keystone Ranch Restaurant which is home to world-class dining and the Keystone Ranch Swimming pool offers picturesque views of the mountain range and Keystone Ranch golf course! When it’s time to call it a night the group can spread out amongst the 2 living rooms, one upstairs and one downstairs, or take a soak in the private hot tub. The open floor plan of the kitchen brings the whole group a little closer and makes everyone feel included in the fun! The master bedroom is equipped with a Queen bed and private bathroom. In the upstairs bedrooms you will find one room with 2 twin beds and just across the hall are 2 more twin beds and a bunk bed with a twin on top and double on the bottom. Down in the basement is another bedroom with 2 twin beds and a second master with another Queen.